I had promised back before Christmas that I would post about the other half of my studioffice. This is the area across from the partner’s desk that I posted about here. Now you can see how this room’s other half lives and see some other craft room design ideas. ***UPDATE: This is Part 1 of the creation of my work table. The link to Part 2 and updated posts that show how I have changed the room and share my craft room design ideas can be found at the end of this post. The room is a rectangle with two windows in the front and a double door on the opposite wall. There is also a single doorway where I am standing to take this photo. 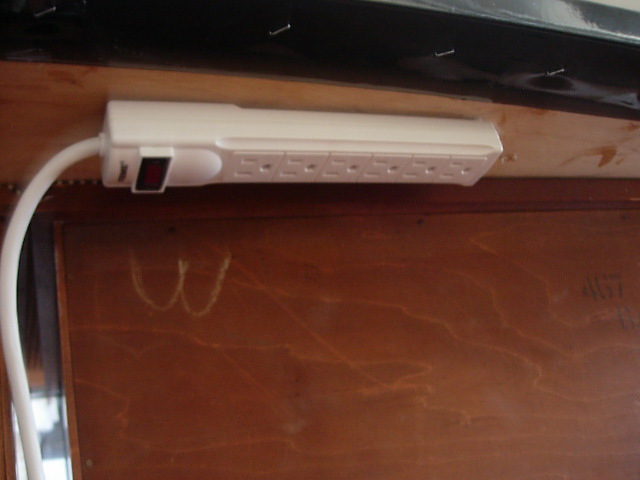 Since no craft table is complete without electricity, my husband, Ed put an electrical outlet in the floor for me. The armoire is a hand-me down from my in-laws. It is very old and comes apart like a puzzle. It used to be painted orange when we first got it and I used it as a pantry closet. In another house it became my actual clothes closet, because there were no closets in the bedrooms. Presently it holds all my craft supplies. The two bookcases on either side are from Ikea. Under the round skirted table is my sewing machine table. I can easily get to it by lifting off the round top and placing it on the floor when I need to sew. I only sew on occasion so this works fine for me. 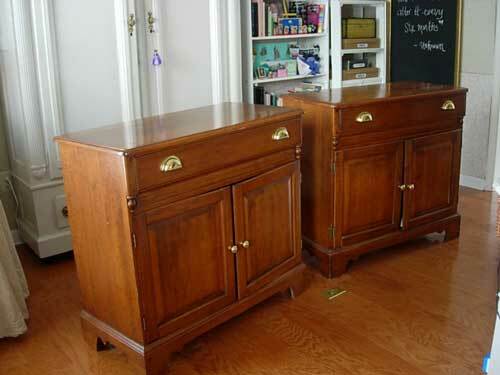 These two cabinets used to be in my dining room. When I got new dining room furniture I didn’t know what to do with them, until I got the idea to use them as the base for my work table. I plan to transform them with paint and molding- that will be Part 2 of this post. 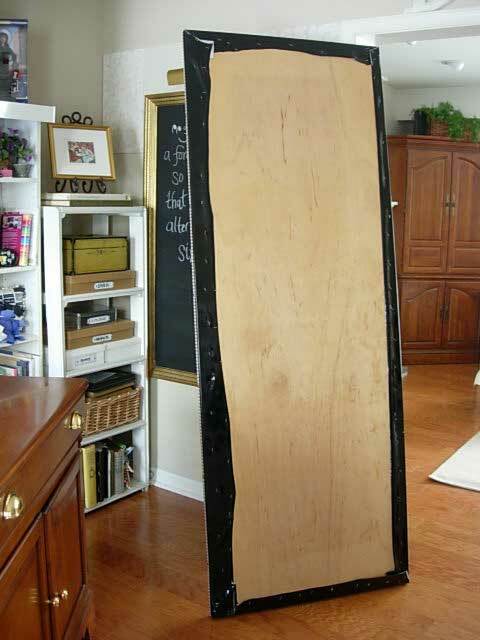 I covered a hollow core door that I purchased at The Home Depot with black shiny vinyl. I stapled the excess to the underside. I found the vinyl at a local fabric store for $1.00 a yard. At that price I bought the whole roll – about 12 yards. I only needed 3 yards for the table. I am not sure how I will use the rest yet, but it was such a great find I couldn’t pass it up. 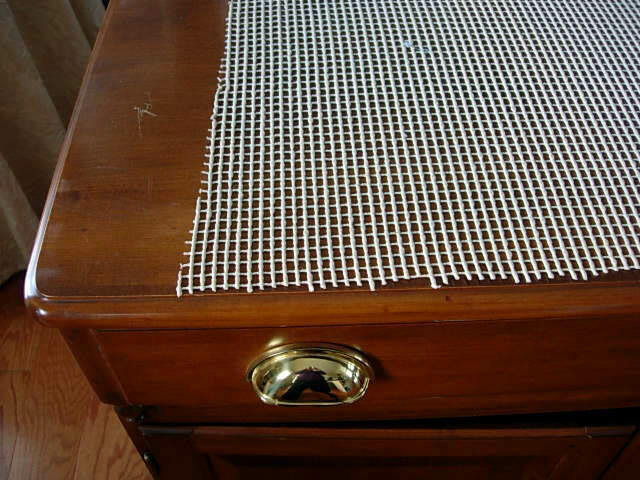 I cut a piece of a rug liner to place on top of the two cabinets so the door would not slide after being placed on top of the cabinets. I simply placed the door on top of the cabinets. I attached decorative ribbon around the edge of the covered door with brass tacks. I attached an electrical strip to the back underside of the table with screws and plugged it into the floor outlet. On half of the table I placed a piece of Homasote and a rotary cutting mat. 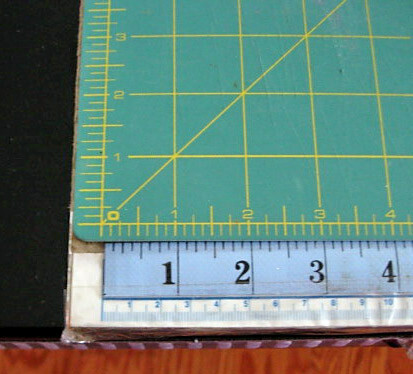 I also placed a measuring tape along one side of the table and secured it with packaging tape. This is the side I glue, cut, and paste on. 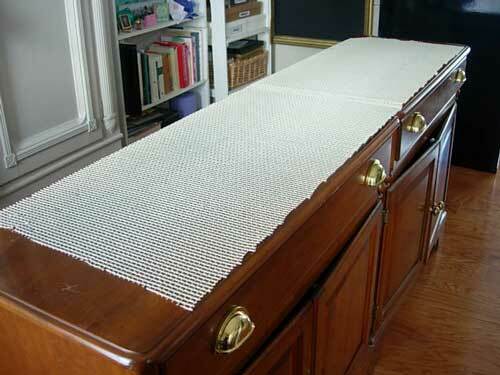 If I need the whole length of the table – the components can be easily removed. This is Trax, my daughter, Kelly’s cat that she brought home with her after she graduated from college. He was raised in a frat house and thinks he can hang out anywhere he pleases. 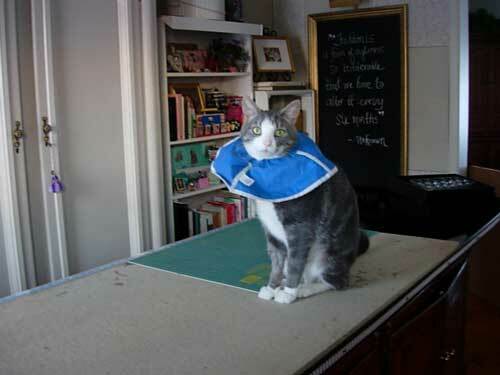 Notice the collar. He just had surgery because he ate a button and it got stuck in his stomach. It cost Kelly- $1000.00 for the surgery. The vet asked her if she wanted to keep the $1000.00 button and frame it. His stitches come out tomorrow. This time curiosity did not kill that cat, luckily. **I have a brand new Studioffice in my new home in SC. Click to see how I have updated it so far. Your office is beautiful and your craft table is so clever. I love it! Our dog had a similar surgery after eating a thumbtack (my daughter dropped it and saw her scoop it up). They should have installed a zipper instead of stitches. Expensive! I’m new to your blog. It’s nice to “meet” you! ok, I am so jealous of your beautiful, clean office space. (yes, I have a very messy, craft room) I love the armoire. I am very jealous! great idea with the rug liner and attaching the power bar. Genius! I must do the power bar. Thanks for the great ideas! Please, stop by sometime! Wow I love your studio, it’s fabulous! That kitty is feeling better now. He is sleeping in a paper grocery bag that he climbed into when I was unloading groceries. Your office looks great – and that kitty is awfully cute! Love your studio! 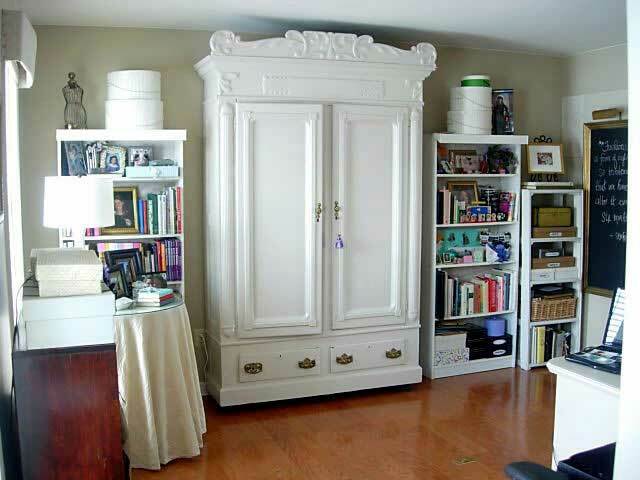 I need an armoire like that! Stopping by from Today’s Creative! Just signed up to follow you, I’m looking for a few new crafty followers too! Your work table is fantastic! I love everything you have done and yes I laughed at the $1000.00 button. I think I would have had to frame it. I have stolen your button and when you get time stop by and visit it. Hi, I am visiting you from SITS. 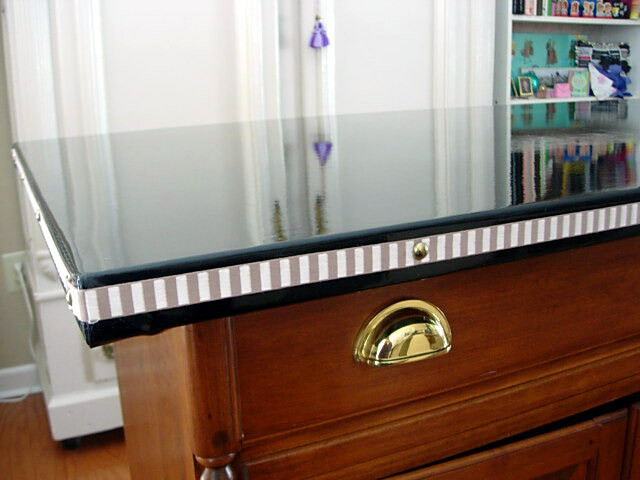 I love your blog and the work table is genius! Very creative! Hi Cha Cha- you are too cute!! I will let you come and you won’t even have to do the dishes. When we first moved into the house I realized that we would not ever use the room that was tagged “formal living room” so I claimed it as my space. In previous houses I have lived in I had my space in the attic and in the basement. This is by far the best. I’m sorry I don’t like you any more, we can’t be friends. Because I am green with envy and I don’t think that makes for a good friend, I am sorry. I really do like your studio, how awesome to have a place that great to create. If I move in can we work together I promise to do my own dishes. I hope you have a great week. Very nice – it’s always difficult to find a large workspace – this is smart! what a great idea. so much function! It is gorgeous! I love it want to come help me with my little craft nook??? I need some inspiration. 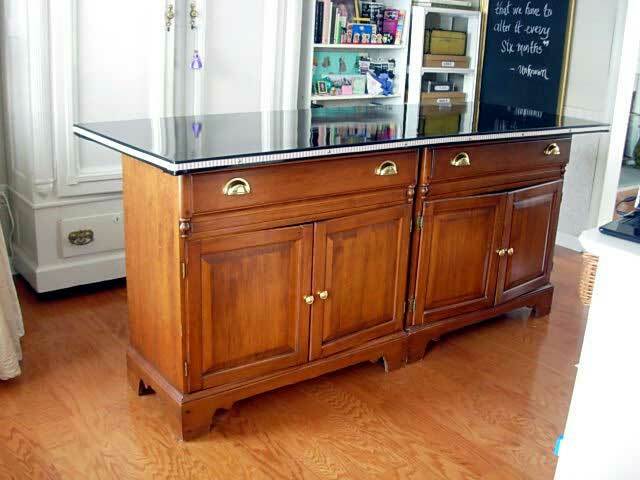 What a great use of the cabinets! Looking forward to seeing the rest. Oh so creative… fantastic idea! Love the table. Great job.